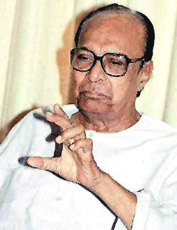 Bijayananda Patnaik is commonly known as Biju Patnaik. He was a heroic personality and he achieved his name and fame through hard work alone. Apart from being a politician, he was an aeronautical engineer, navigator, industrialist, an ace pilot, popular freedom fighter and above all a renowned and outstanding personality. His looked up to Napoleon and thus he followed in his footprints. Biju Patnaik was proficient in inspiring and gaining the confidence of his people. He communicated effectively with the public and had the ability to convey his ideas to them. According to Biju, there are four important things and these are unity of nation, secularism, democracy and imperialism. He, with a strong determination and sacrifice became a great politician and a social activist. He actively participated in the struggle for freedom and thus became the ideal personality for the people of Orissa to look up to. He uttered these lines for the public of Orissa, In my dream of the 21st century for the State, I would have young men and women who put the interest of the State before them. They will have pride in themselves, confidence in themselves. They will not be at anybody`s mercy, except their own selves. By their brains, intelligence and capacity, they will recapture the history of Kalinga. Biju Patnaik was born on 5th March, 1916 in Cuttack, Orissa. He was the son of the late Shri Laksminarayan Patnaik and the late Smt. Ashalata Devi. His father was a notable nationalist and a leading member of the Oriya movement. He had two brothers and one sister. He completed his early education at the Mission Primary School and Mission Christ Collegiate of Cuttack. In 1927, he got into to the Ravenshaw University, where Netaji Subash Chandra Bose once studied. From his college days, he was a talented sportsman and headed the football, hockey, athletics and cricket team of the University. He was the sports champion for continuously three years. He discontinued his studies to take up training as a pilot at the Aeronautic Training Institute of India and the Delhi Flying Club. As a kid, he always was interested in flying. Thus, he became an eminent pilot and a navigator. Biju Patnaik joined the Indian National Airways and became a ace pilot. During 1940-42, when the struggle for independence was going on, he was the chief of the Air Transport Command. Patnaik now has two sons and a daughter. His elder son Prem is an industrialist and the younger son, Naveen is a famous politician and is also the Chief Minister of Orissa. His daughter, Gita Mehta is a well-known novelist and writes on the westernization of India. Biju Patnaik had an inborn love for his native state Orissa and inherited the qualities of heroism and bravery from his parents. Biju Patnaik was inspired by Mahatma Gandhi, who fought for freedom. He took part in the Quit India Movement and was sent to jail in 1943 for two years since he was found guilty of taking freedom fighters to secret places in his plane. When the Second World War started he joined the Royal Indian Air Force where he gelled with the British and became friends with them. In 1941, when Japan stepped into the war and attacked Myanmar, he rescued the British. He played a very important role in the freedom movement of Indonesia. He, under the guidance of Pandit Jawaharlal Nehru, rescued the Indonesian people from the clutches of the Dutch rulers. On 23rd March, 1947 Pandit Nehru invited 22 Asian countries for the First Inter-Asia Conference and for this, Sultan Sjahrir, the Prime Minister of Inodnesia, was cordially invited too. Pandit Nehru trusted Biju Patnaik asked him to ensure the safe arrival of Prime Minister Sultan Sjahrir, which is exactly what Biju did. After this, he became a heroic personality amongst the Indonesians who actively participated in the gaining of the independence of their own country. In 1946, Biju was elected to the Orissa Assembly from the North Cuttack Constituency. From 1961 to 1963, he worked as the Chief Minister of Orissa. He was also the member of the Lok Sabha as well as a member of the Rajya Sabha. In 1975, when there was an Emergency in the country, he was the first to be prisoned with other political leaders of the opposition. In 1977, he was released and elected to the Lok Sabha from Kendra Para and till 1979 under the government of Morarji Desai and Choudhary Charan Singh he was the Union Minister for Steel and Mines. In 1980, Biju was elected to the Lok Sabha and then again in 1996 he was re-elected to the Lok Sabha. In 1989, after the defeat of the Congress Party, he came into the limelight as a political leader but when V.P Singh became the Prime Minister he went back to Orissa and contested in the assembly election. In the 1990 state assembly election, Janta Dal won and Biju Patnaik again served as the Chief Minister of Orissa till 1995. He always tried to make Odisha a special position among the all state.His succesful project-Paradeep Port, HAL (Sunabeda), NTPC Talcher, Sukinda Paradeep Express Highway, Balimela Hydro Power Corporation,Hirakud Dam, NIT Rourkela(Previously Regional Engineering College), Sainik School, OUAT and many more..He also tried to develop small scale industries in odisha. So he established Kalinga Tubes, Kalinga airlines, Kalinga Iron Works, Kalinga News Paper. He was honored by the Indonesian government with the highest civilian honor ‘Bhumi Putra’. This recognition came to him owing to his bravery and heroic feats. In 1996, when Indonesia was celebrating its 50th Independence Day, Biju Patnaik was awarded the highest national award, the ‘Bintang Jasu Utama’. In 1952, he established the Kalinga Foundation Trust to encourage scientists from all around the world. He initiated the Kalinga Prize, which the UNESCO has been awarding for excellence in the field of science. Beside this, he also spent a huge amount to build the Paradeep Port. 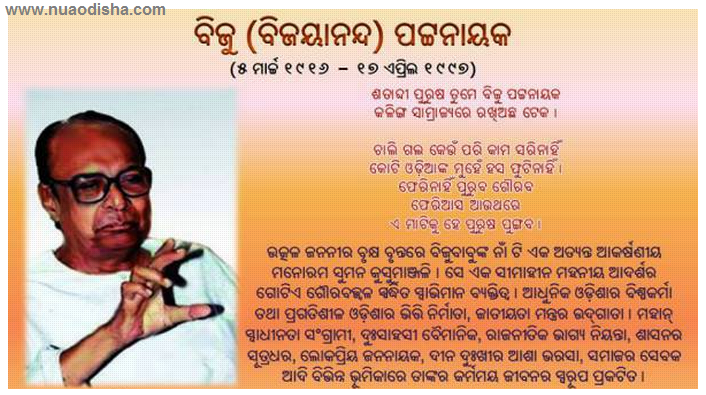 Biju Patnaik died on 17th April 1997, due to a cardio-respiratory malfunction. In Odisha, there are various institutions named after Biju. One of these institutes includes the Biju Patnaik University of Technology. The airport of Bhubaneswar is also named as Biju Patnaik Airport. Biju’s son Naveen Patnaik declared 5th March, his father’s birthday, as Panchayati Raj Divas. This day is an acknowledged holiday in Orissa.